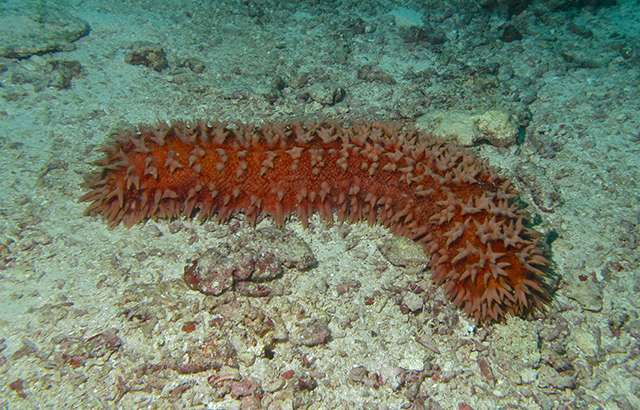 Scientists from Queen Mary University of London (QMUL) have discovered for the first time how marine animals called sea cucumbers can rapidly change the stiffness of their body, which could provide a useful basis for developing novel biomaterials for applications in medicine. All animals have collagen, but one group of marine invertebrates – the echinoderms, which includes starfish and sea cucumbers – have evolved to have collagenous tissues with a unique property: they can rapidly change their stiffness. This type of collagen is known as mutable collagenous tissue (MCT) and is controlled by the nervous system, and is useful when, for example the animals need to 'turn to jelly' so they can avoid predation. However, the mechanisms by which the sea cucumber can change its stiffness were not known until now. Lead author Dr Himadri Gupta from QMUL's Institute of Bioengineering, said: "The sea cucumber's MCT may serve as a template for bio-inspired materials, which can mimic its remarkable properties. These could be useful in flexible scaffolds for tissue engineering, cosmetic treatments against skin ageing, implantable biosensors, and materials for soft robotics." Reporting in the journal Proceedings of the National Academy of Sciences, the QMUL team analysed the body wall of sea cucumbers using X-ray techniques at the European Synchrotron Radiation Facility in Grenoble, France. Co-author Professor Maurice Elphick from QMUL's School of Biological and Chemical Sciences, said: "Sea cucumbers are amazingly flexible and this study shows that their ability to shape-shift is not a result of any changes within the collagen fibrils themselves, but in the interfibrillar scaffold that cross-links with them." First author and PhD student Jingyi Mo, from QMUL's School of Engineering and Materials Science, added: "Many collagenous or collagen-like biomaterials are designed to match surface chemistry of cells and tissues in the body, but there are very few that can change their mechanical properties rapidly."